It shows all the returns and trading volume, but if I want to find out the cost of each fund, I will have to click on each item and go to the fund’s separate page to get the information I want, which happens to be one of the most important data when evaluating a fund. Then I recently found a couple supplemental tools that can give me most of the information I want without checking the funds one by one. For all-in-one-page ER data, XTF ETF Finder is the tool I am now using. 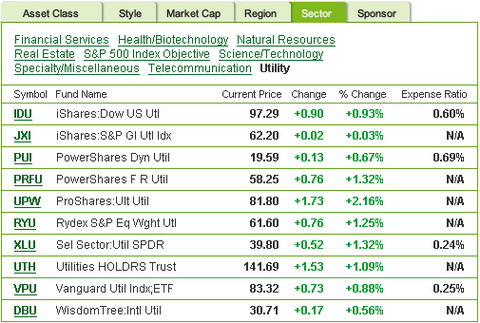 ETF Finder conveniently lists all the ETFs, by sector, style, asset class, or market cap, with their ERs. One drawback, however, is that I can’t sort the funds according to their ERs. For some new ETF offerings (those having a few months of history), neither XTF nor Morningstar reports ER information. In this case, I will have to use the fund’s prospectus to see how much the fund will charge in fees. In addition, XTF also has Advanced ETF Screener. Since I usually pay a great deal of attention to the fund’s yield, it would be nice if I can easily get distribution data from multiple funds for easy comparison. For that, I use ETF Connect’s ETF Sorter. 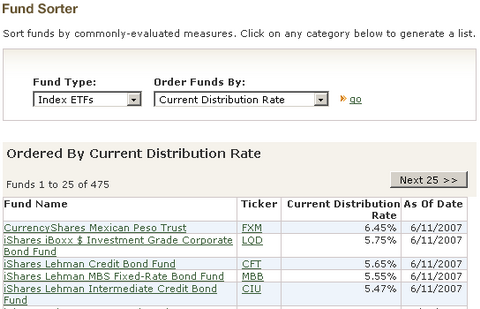 Here, funds are sorted by their distribution rates, so I can easily find out the fund’s yield in a single page. Thank you, thank you! I’ve been struggling finding and researching ETFs. This is exactly what I have been looking for! I’ve been trying to compare ETFs with similar index funds and was having a tough time doing it but finally came across a tool on the TD Ameritrade website that allows you to compare them. It has been extremely helpful. Haven’t seen this anywhere else yet. Bruce: Thanks for the tip. I haven’t heard anything like that either, but it could be very helpful to see how the fund is actually doing against the index that the fund is tracking. The only problem, however, is that the tool may not have enough indexes data to compare every fund, especially when the index the fund tracks are not very popular. For instance, I tried PHO and it didn’t find any fund that matches it. I need to play with it a little bit more to see what it can do.